Daily, 10am to 5pm during exhibitions (unless otherwise stated), including Bank Holidays. Many exhibitions close early on the final day, please check details for each exhibition. 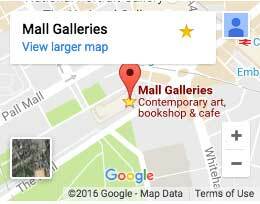 Many of Mall Galleries’ exhibitions are free (please see details on each exhibition page, or telephone 020 7930 6844 for details). Concessions include: Disabled people (with free entry for one carer), Students, Registered Unemployed. FREE to Friends of Mall Galleries and Under 18s. Admission ticket includes access to guided tours, demonstrations and day events. For further information, please download our ACCESS STATEMENT.